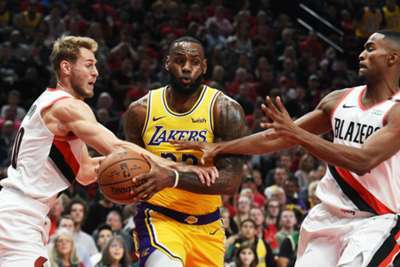 LeBron James offered food for thought after his Los Angeles Lakers debut ended in a defeat to the Portland Trail Blazers, warning it will take time for them to serve up "instant oatmeal". James scored 26 points, claimed 12 rebounds and provided six assists but sloppy defending and the Blazers' superior three-point shooting cost the Lakers. The four-time MVP's points tally was the joint-second best on debut for the team, just one short of Kareem Abdul-Jabbar's record. James called for patience as the Lakers gel after they were consigned to a 128-119 defeat on Thursday. "I always compare it to instant oatmeal, it's not that fast, it takes a while for the chemistry to get to where you could close your eyes and know exactly where your guys are. That's what we're gonna work towards," he said. "It's still early, still gotta go through some things, go through some adversity and see how we react to it. "Just the timing with some of our passes. I had one in the fourth quarter where I expected Kuz [Kyle Kuzma] to pop, he rolled and I threw it out of bounds. "We talked about it and those things will get better. We ran a play late in the game as well and I turned the ball over. [Rajon] Rondo had a couple, he drove the baseline and JaVale [McGee] thought it was going to him, it was going to me and he knocked the ball out of bounds. "They're things we all continue to work on with one another."